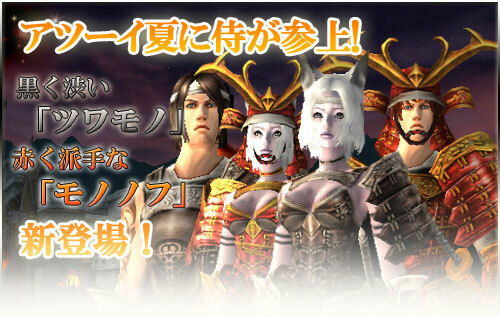 This week new suits were released in Japanese Archlord. Not only one type, but two - something unusual as only one type of suits is always introduced to the players. Both types resemble Asian tradicional clothing and complete a total of 5 Asian-based sets (2x Kimono suits - one red, one blue, Shinobi - Ninja - suit and Shogun suit, the green one). The red suit is called Mononofu, an ancient word used for samurai which means "warrior". The black suit is called Tsuwamono (lit., "Strong person"). The word was created by the poet Banshou Matsuo during the Edo period and was used in his haiku (poems) to name soldiers. These new suits are available for one month only (21st July - 24th August).